P99640LF-BN is rated 4.7 out of 5 by 39. Rated 5 out of 5 by BHB1 from Great value! Our bathroom remodeling project was getting close to going seriously over budget. I sure can't say it was the fault of Peerless. This faucet looks great, works flawlessly and was a great value for the money. 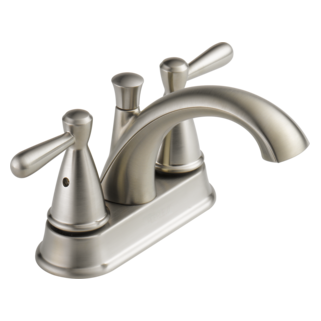 Rated 4 out of 5 by Tommy B from Nice looking faucet Attractive faucet that is easy to install and works well. 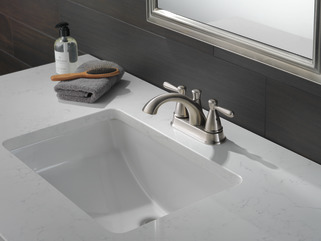 Only suggestion would be to lengthen the water line connector as installing on new granite vanity top used every available thread on the connector. Rated 5 out of 5 by Clean hands from Bathroom faucet replacement Purchased this product as a replacement bathroom faucet. It works well. The warranty convinced me to buy it. Rated 5 out of 5 by JHNC from Good value for the money. Lifetime warranty and reasonable price made the decision for me. Rated 5 out of 5 by Gkiteguy from Easy to install Went in without issues as the instructions clearly showed. The tool for removing the aerator will probably get lost. Rated 5 out of 5 by Lucky Dog from Nice quality I bought this faucet at Lowe’s on sale for $29.99. Very good fouler for the price. Rated 5 out of 5 by Rob S from Good Quality- Easy to Install I was looking for an inexpensive bathroom faucet that was of decent quality. I've bought them before and they don't last too long. As I removed the old one and readied the new Peerless faucet, I immediately noticed the materials were better quality in the Peerless faucet. It installed easily--no more than 10 minutes! The faucet works well and unlike the previous ones I purchased, I expect this to last a long time. Is the included drain for use with sinks with overflow or without overflow? Are there finishing cover plugs for hot and cold water handle screws?